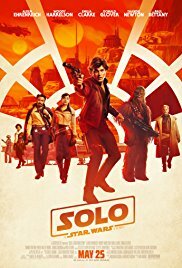 I went into the cinema for Solo aiming to keep my expectations low. Therefore, I came out pleasantly surprised. Okay, this is not a movie about which I would rave. However, it was an enjoyable 2-hr action-adventure, and one I would watch again. I appreciated seeing how Han and Chewie met, and the famed Kessel Run. Donald Glover stole all his scenes as Lando, but what of the young Han? For me, Alden Ehrenreich was a mixed bag. In terms of his physicality (e.g. shooting stance) I definitely felt I was seeing a young Han, but that didn't come across as well in his speech. The inflections didn't feel the same as Harrison Ford's, and I would have liked just a little more parity there, to make it seem like they are the same character. But, overall, a pleasing sci-fi flick, with enough nods to the past (or should that be future?) to keep fans happy.